Say what you will about the Pop Vinyl toy aesthetic, there is something to be admired in Funko’s ability to acquire licenses for their toys like grey goo nanomachines devouring their way across the face of the Earth. Case in point, the company announced like, a hojillion toys at the UK Toy Fair yesterday, and we want them all. Seriously, all these are due out this year at some point, so if you collect Pops—or, are inevitably gifted one because there is totally a series for that movie/TV show/video game/thing your relative knows you like—you’re going to need to make some space on your shelves. Check out the biggest reveals below. The company’s cutesy take on the Mighty Morphin’ Rangers now comes in plush toy form. Yes, they’re that specific with the decade. But look! Aaahh! Real Monsters toys! What is Clexa may never die... as long as it’s in Pop vinyl form. On the TV show, not so much. Teen Wolf’s werewolf forms look honestly petrifying in the Pop vinyl style. Funko’s mystery minis series of blind bags gets a new wave based on all the DC TV shows (even Gotham! ), meanwhile, the next wave of Batman: The Animated Series figures gets an adorably angry HARDAC Batman. No, not Marvel’s Alias. The show where apparently, no one had any idea what was going on, including the cast. The bags under the giant, black eyes of the Eliot Pop are what really makes this series worth it. Funko isn’t just making Pops to celebrate 2017's return to Twin Peaks. There’s going to be a line of 3.75-inch action figures too—and amazingly, they both come with dead Laura Palmers. Sure, there were Hobbit ones, but who cares? Now there’s finally a line of LOTR Pop vinyls coming. Not the anime, but the upcoming live-action movie. The newest game in the saga cannot escape Popification. Now Tom and Crow can sit on your desk and narrate your every activity like it was Manos: The Hands of Fate. 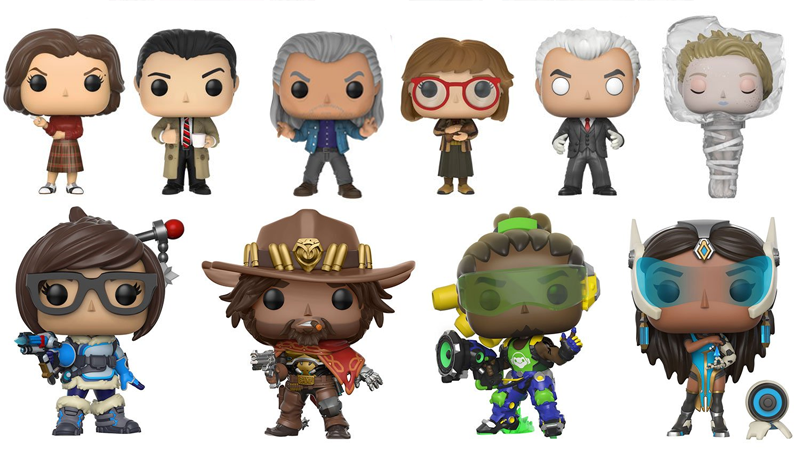 The world could always use more heroes, and it almost definitely could use more Pop vinyls of the cast from Blizzard’s excellent team shooter. Be prepared to both slam and jam with both a line of Space Jam Pop vinyls as well as a wider Looney Tunes range for Funko’s cutesy “Dorbz” series. And somehow, there’s more coming on the way, which will be shown at the New York Toy Fair next month. Will 2017 finally be the year everything is a Funko Pop? It seems probable. You can see even more Pops, Dorbs, and action figure pictures over at Funko’s blog. Cowboy Bebop Pop Vinyls? Cowboy Bebop Pop Vinyls!